Announcing Global Launch of MobiPrize 2014 for Sustainable Transportation Enterprise! Applications close July 7! With your help, SMART at the University of Michigan is crowd sourcing and honoring New Mobility enterprises that are making the world a better place through sustainable transportation enterprise. All entrepreneurs (anywhere in the world) addressing sustainable transportation challenges and opportunities with innovative and sustainable solutions and business models are encouraged to apply. Apply now and / or spread the word! 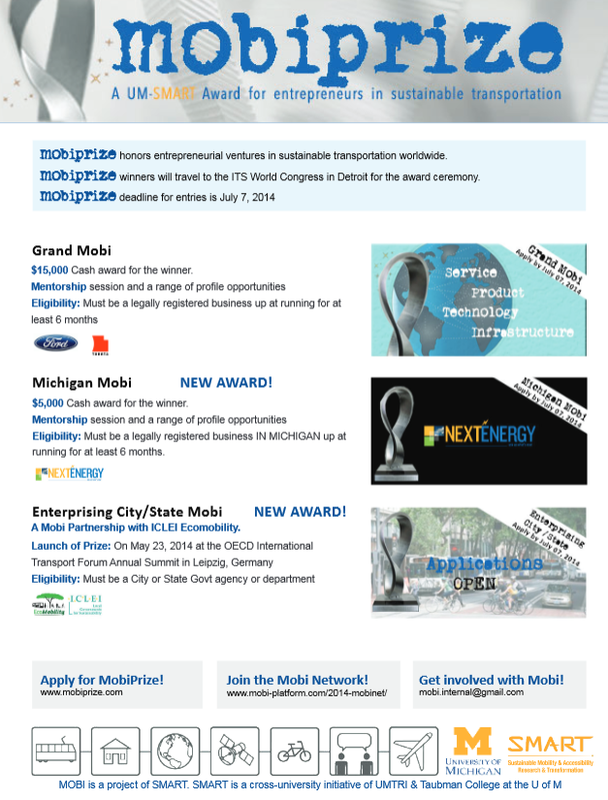 This year we have three prizes – one is the “Grand Mobi” Prize (sponsored by Takata and Ford Motor Company), one is for Michigan-based entrepreneurs (sponsored by NEXT Energy) and one is for cities or states that are encouraging New Mobility innovation and enterprise (in partnership with ICLEI Eco-Mobility Alliance). • Travel to Detroit, Michigan in the US to receive the prize at the ITS World Congress being held from Sept 7-11,2014, and to present on a world stage. This is a great opportunity to get profiled and to network, thanks to our partners at ITS America and ITS World Congress. 1. The Grand Mobi: It’s now 3 times grander (thanks to Takata and Ford Motor Company). 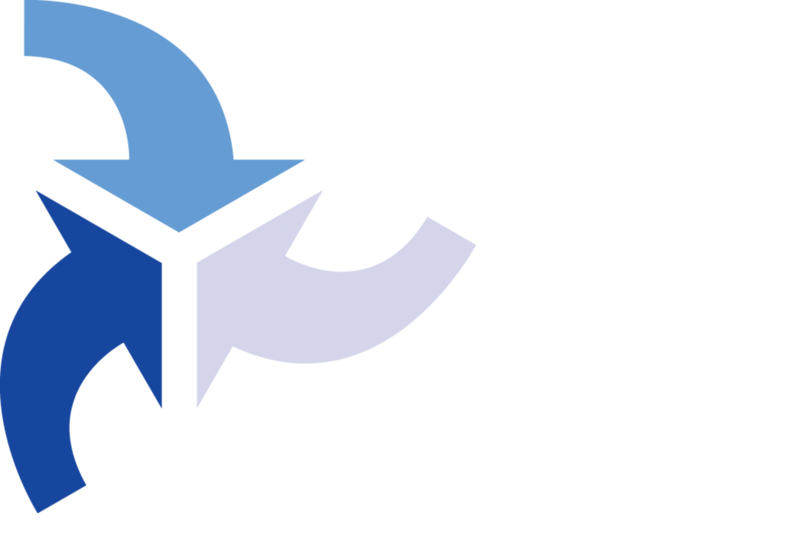 This is a $15,000 award for the innovative business venture that has the greatest impact on improving quality of life, and / or improving safety and / or revitalizing the environment and economy of communities and regions and / or supporting human rights through sustainable transportation/New Mobility. (Sponsored by Takata and Ford Motor Company. 2. MobiPrize for Michigan Entrepreneurs (NEW! ): This is a $5,000 award for Michigan-based entrepreneurs who, through their innovative New Mobility technology, service; product and/or infrastructure venture are contributing to the Michigan region and economy. (Sponsored by NextEnergy) APPLY NOW! 3. Enterprising City/State Award (NEW! ): For 2014, SMART MobiPrize has partnered with ICLEI Ecomobility to create an award of recognition for City/State governments that have demonstrated active efforts to build a culture of innovation and encourage entrepreneurship in sustainable transportation. They may have done this through enabling policy changes, capacity building, data sharing, funding (including Public Private Partnerships) and other resource allocation efforts, etc. This award launch took place on Friday, May 23 at the OECD International Transport Forum (ITF) Annual Summit in Leipzig (thanks to our generous partners at ITF). MobiPrize applications will be evaluated by a prestigious jury of experts in the field (http://um-smart.us7.list-manage.com/track/click?u=d35221ee858ba82d2771602f4&id=db0ffd3e02&e=f4fb22e520). For more information on MobiPrize 2014 go to www.mobiprize.com or contact Komal Anand at info@mobiprize.com.